Long before there was ISIS, civil war in Syria, an Arab Spring, Al Qaeda, the U.S. invasions of Iraq, civil war in Lebanon, and the Israeli-Arab conflict, Middle East Christians were on the move. Whether hiding from persecution by Jewish leaders, Roman emperors, Persian forces, Byzantine bishops, Muslim Arab invaders or Ottoman bureaucrats, the region’s Christians demonstrated agility, tenacity and the will to survive. As they moved from place to place — leaving behind their ancient centers of Antioch or Edessa — Middle East Christians preserved their identities, their cultures, their languages, their rites and their unique approaches to the one Christian faith. They reestablished their monasteries and convents, churches and schools from Beirut to Baghdad, prospering in the modern era even with the rise of ideological fanaticism and its destructive twin, intolerance. But the sixth day of August 2014 will be forever seared into the psyches of all Middle East Christians. For on that day, maniacal extremists upended the lives of more than 100,000 Iraqi Christians, forcing them to flee their homes, leaving behind everything in a matter of minutes. The human cost of the displacement of the Middle East’s Christians is tremendous. Although they may account for only about 5 percent of the region’s population — about 15.5 million people — Christians dominate the region’s middle classes, exercising prominence in the tourism industry, commercial and skilled labor sectors, and the civil service. And as they flee the extremists rapidly taking hold in the region, moderates from other communities follow, leaving behind those who cannot leave — the poor, the uneducated, the elderly and the infirmed — and those who stand to gain by fanning the flames of hate. ...The flight of Christians from the region is arduous and painfully slow. While hundreds of thousands have been displaced from their homes in Iraq and Syria, most exist in a sort of limbo, hunkering down with friends and family in safer areas of Lebanon, Syria’s Valley of the Christians, the Hashemite Kingdom of Jordan or Iraqi Kurdistan. Some 12,000 Syrian Armenian Christians have found refuge in Armenia, but few others have acquired the coveted visas necessary to emigrate to the Americas, Europe or Oceania, where most Middle Eastern Christians now live. Just a few months into their exile, the Rifo family was not yet able to accept the possibility of emigration. Her husband Nabil had different thoughts. “Even if we go back to our houses, we have lost our sense of security,” he said, adding that some of his non-Christian neighbors and colleagues were responsible for the looting of abandoned Christian houses. Others joined ISIS. There is much more. Read the full speech at this link. Ukraine’s Minister of Foreign Affairs, Pavlo Klimkin, receives a copy of ONE magazine from CNEWA’s Antin Sloboda during a meeting at the Ukrainian Embassy in Ottowa last week. Last week I had a chance to attend a meeting with Pavlo Klimkin, Ukraine’s Minister of Foreign Affairs, at the Ukrainian Embassy in Ottawa. Mr. Klimkin’s recent visit to Canada to a large extent was an expression of gratitude to the Ukrainian-Canadian community and Canadian government for taking a leadership position in supporting Ukraine in this time of crisis. At the end of the meeting I presented him with the newest addition of CNEWA’s magazine ONE. The cover story of the magazine has an article by Mark Raczkiewycz, “Casualties of War,” about the suffering of Ukrainian people and the ways Catholic charities — including CNEWA — are providing support to the affected population on the ground. Besides providing resources for the internally displaced and other people in need, CNEWA plays also a very important role in sharing with the English-speaking world objective information on the situation on the ground. The article by Mark Raczkiewycz is a good example of CNEWA’s multifaceted involvement. Here’s another example. On 29 May, CNEWA Canada and the Ukrainian National Federation of Ottawa-Gatineau Branch are organizing a special event in Ottawa to raise funds for Ukraine’s internally displaced. The funds will go to CNEWA’s long-term partner Caritas Ukraine, the main humanitarian charity of the Ukrainian Greek Catholic Church. Right now Caritas Ukraine provides support to over 80,000 victims of the conflict in Eastern Ukraine. If you can be in Ottawa on 29 May, please join us at this event. Tickets are still available. If you cannot come to Ottawa, please still consider making a meaningful donation for the victims of war in Ukraine. Just visit this link for details. Thank you. After fleeing Eastern Ukraine, this family has taken shelter in a rented house in Izum. 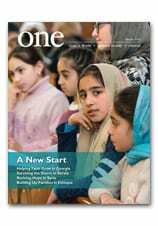 Journalist Mark Raczkiewycz reports on the plight of families displaced by war in Ukraine in the Spring 2015 edition of ONE. Here, he explains the dread that now hangs over the people. War will come back to the government-controlled area of Donetsk region this spring, six displaced people predicted during interviews in early March. It’s an inescapable foreboding that was constantly echoed from people who’ve lived through constant shelling, fear and stress once before. The former bank security guard and others felt that Russian forces won’t stop. They had already taken Debaltseve after the third truce had taken effect in February. The city, with a pre-war population of 25,000, was leveled. It has now fewer than 7,000 residents, 5,000 of whom are estimated to be living underground in basements and improvised bunkers, according to a 6 March statement delivered by John Ging, operations director for the UN Office for the Coordination of Humanitarian Affairs. In a sense it still does. Two weeks before we visited Slovyansk to speak to a refugee from Donetsk City, Ukraine’s KGB-successor agency, the SBU, had detained two residents who were part of a network of informers for the separatists. On the day we set off from Kharkiv, the vehicle of the commander of a special police battalion, Andriy Yanjolenko, exploded in the government-controlled eastern city. He and his spouse were inside the car and both were hospitalized with severe wounds. Kharkiv and Odesa, both outside the combat zone, have been the scenes of a spate of mysterious bombings that Ukrainian authorities attribute to Russian special forces and their agents in Ukraine. The most powerful attack came on 22 February. An explosion killed four people and wounded 15 when a bomb detonated at the front of a pro-Kiev peaceful march to commemorate last year’s Euromaidan movement. For these reasons, the atmosphere is tense. A 67-year-old pensioner from Donetsk, as well as the others, say they just want to live in peace regardless of who’s in charge. Read more in “Casualties of War” in the Spring edition of ONE. In the video above, a humanitarian worker in Syria decsribes the situation in his country. But We Still Have Our Faith in Jesus Christ"
The head of the Vatican’s Congregation for Eastern Churches visited Iraq to convey Pope Francis’ blessing and concern for Church officials and the displaced living and working in difficult circumstances. In Dohuk, Cardinal Leonardo Sandri hugged children and comforted adults who expressed only one wish: to go back home. Pope Francis’ envoy left a few pictures of the pontiff that children held proudly, with large smiles. The displaced slept up to 20 per room, with baggage and cardboard boxes marking the space for each family. Carpets on the floor and an ever-running television were the only comforts for 60 families that share a few gas stoves and even fewer toilets. The Mass’ main celebrant was by Syriac Catholic Patriarch Ignatius Joseph III Younan, but Sandri preached. In his homily, he spoke of the massacre of Assyrians by the Ottoman Empire a century ago. “We remain speechless,” he said, “before this violence and aggression, but mostly because the human heart seems to have learned nothing from the dramas that shook the 20th century and that continue today while shedding more innocent blood with a blind and destructive blindness. “Your pastors, the Pope and the universal Church fear a general exodus from lands that have been Christian for 2,000 years,” he said. Before going to Erbil, Sandri spent three days in Baghdad, where he met with Iraq’s president and prime minister. Iraq without Christians would not be Iraq anymore, Prime Minister Haider al-Abadi told him, echoing Pope Francis’ recurring declarations about the Middle East. President Fuad Masum told the cardinal he hoped the Pope would visit as soon as the situation will allow it. In Erbil, Sandri met with about 10 members of ROACO, a coalition of funding agencies co-ordinated by the Congregation for Eastern Churches. Among them were the heads of French and German agencies as well as Aid to the Church in Need, the Holy Childhood Association and the Catholic Near East Welfare Association. During the two days prior to that meeting, members of ROACO visited many camps with displaced people, trying to evaluate their needs. Msgr. John Kozar, head of Catholic Near East Welfare Association, told Catholic News Service that water is the “single most important reality” and is always in short supply. An oil over acrylic painting called "Burden" by Syrian artist Essa Neima. At a recent exhibit, his oil on acrylic works ranged from depictions of damaged church and mosque mosaics, to a broken icon of Mary and a refugee woman forced into servitude by the need to survive. Most of the paintings were strewn with the deep red color of blood. “It is like treasure ... covered by blood because (of) what’s happening now, the sad events happening in Syria,” Neima told Catholic News Service in Washington, thousands of miles from his country, where conflict has killed nearly 200,000 people and dispersed about 10 million others, according to U.N. Estimates. ...He said he hoped his paintings would encourage more Americans to stand up against the war and to learn more about Syria’s rich heritage and culturally diverse society, often overlooked in U.S. news outlets, which he claimed were simplifying his country’s conflict. “My message from this art show (is) to be a little bit optimistic about the situation and see things you don’t see it in the media,” Neima said. But even Neima seemed hard-pressed to understand how a conflict so violent could erupt in multicultural Syria, where he said he counted many friends from among the Arab country’s predominantly Muslim population. “The Syrian society, when I was living there, was ... a liberal society. It wasn’t like I support the extremists because I am Muslim, or like because I am Christian I will belong to so and so ... there was not this category,” Neima said. To learn how you can support the suffering people of Syria, visit this giving page.